Now, have you given any thought as to who decided that Hallmark was and is the “very best”? For 70 straight years, no less. Was it a poll? Was it an independent greeting card association? Was it decided by their peers? No. Actually, Hallmark decided they were the very best. One of their sales executives came up with that conclusion right around the time World War II was ending. They were ahead of their time. People may have been too distracted by other things to question it, then. Humility seems to be a 20th Century characteristic. It doesn’t want to fit into a 140 character world. Thailand Footprint will be 1 year old in mid-April. So I am very pleased to announce that we are the recipient of an award. 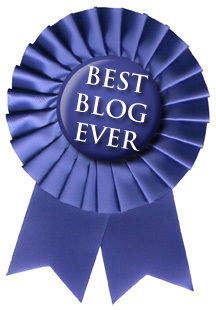 The Best Blog Ever Award. Because if we see it written on the internet, it must be true. Right? And in case you are wondering, who selected Thailand Footprint as, Best Blog Ever? Well, I did. But it still looks good, dontcha think? If you got this far, thanks for reading Thailand Footprint. Seriously. I appreciate it. I don’t know how much longer I will stick to it but it has been a lot of fun. If I have created a little entertainment for any of you readers out there, then so much the better. Just don’t get a swelled head. I’ll do my best, Carl. Thanks.